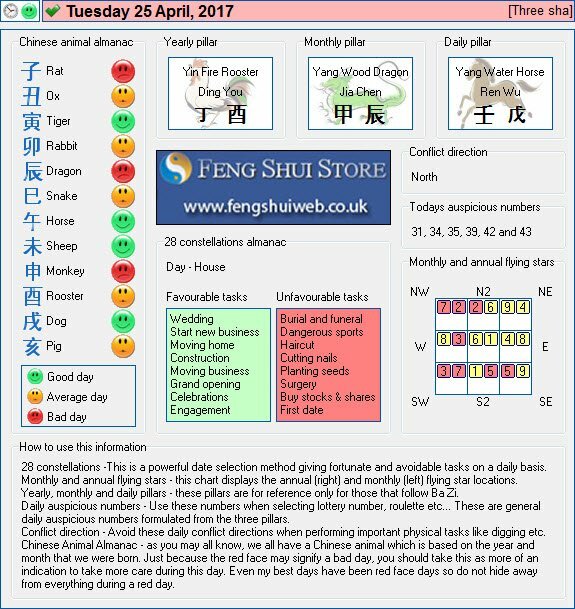 Here is the Free Feng Shui Tong Shu Almanac for Tuesday 25th April 2017. What’s this ‘three sha’ comment in the above right corner and when will it end. I’m having a terrible time, jaw-droppingly and sometimes just laughably. Three Sha days are a conflict date which can cause problems such as injuries. You’ll be happy to know that Thursday will see the end of this long Three Sha.